Located about 6 miles west of the WY/SD border on I-90, this 5,000 SF Wyoming Welcome Center is a Zero Net Energy building. Malone Belton Abel assisted Wyoming Travel & Tourism and WYDOT with the site selection process, considering 10 possible sites along I-90. Criteria included excellent visibility and easy access from the Interstate; proximity to the Wyoming border; and proper site size and character. 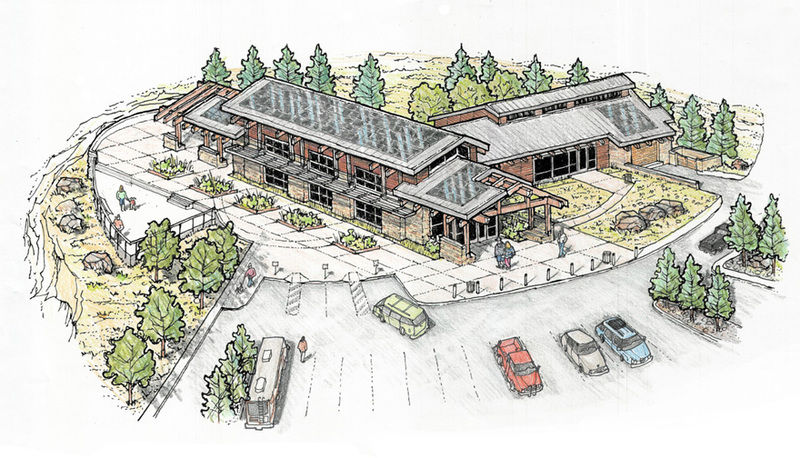 The building design, geared to visitors from east of Wyoming, many of whom going towards Yellowstone National Park, is of a classic heavy timber and stone design with subtle modern accents. The entry is very clearly defined even though we have provided a secondary after-hours entry for the always-open restroom portion. This after-hours entry becomes the primary entry with lighting changes appropriate to the time of day. Most notably, we have designed this building to be a Zero Net Energy facility, meaning that it will generate as much energy as it uses, and likely more than it uses, making it philosophically similar to Wyoming itself, which generates far more energy in its natural resource abundance than its small population would ever use. 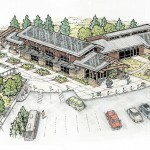 We believe this is the first Zero Net Energy building to be constructed by the State of Wyoming. Its primary source of power is 50KW array of photo-voltaic panels, roof-mounted so as to be fully integrated with the architecture. The primary source of winter heating and summer cooling is a series of 14 geothermal wells. The wells and geothermal system function year-round to transfer heat between the building and the wells. Paired with its low energy use, we have specified low-maintenance building materials inside and out for maximum ease of cleaning and longevity. Costs for the building and site came to $4.9M.